Character: Peat smoke, "dirty" sherry with a clear hint of sulfur and oak play the music here. A very intense filling with corners and edges. As Islay recognizable but as good as without maritime characteristics. The beautiful Brennereicharakter of Kilchoman is indeed there, but is slightly unpleasant and clumsy sherry superimposed. For me, an Islay whisky with clear bonds from Campbeltown. Rating: So far I have not had a bad Kilchoman in the glass and I also like this filling. 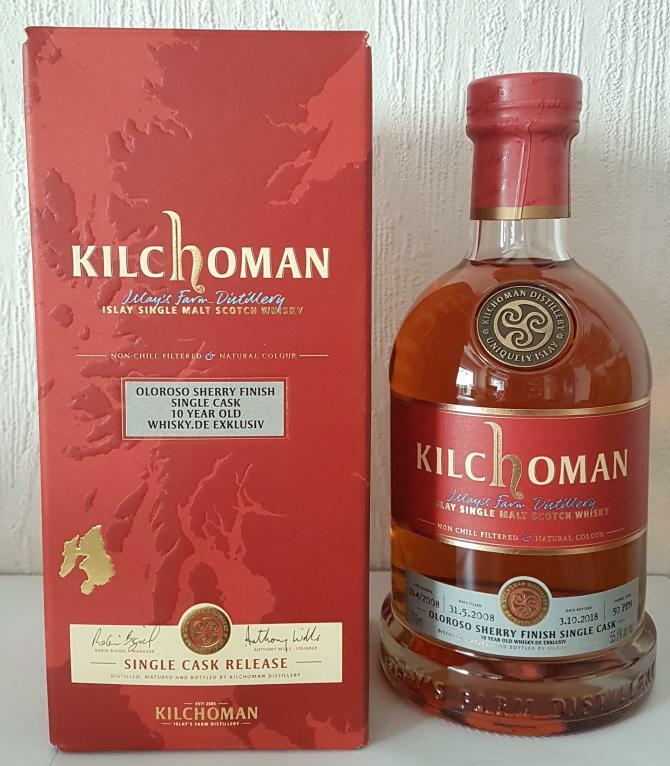 A love at first sight / on the first 5cl is the Kilchoman with this Oloroso finish but somehow not. I'm pretty sensitive to sulfur. The sulfur does not spoil my bottling, but diminishes my enjoyment. Too bad that the beautiful Brennereicharakter of Kilchoman is superimposed. Without the dirty sherry impact, the 90-point mark would probably have fallen. So today and after two tests at well-intentioned 89 points. As I said: somehow a Kilchoman for Longrow / Campbeltown lovers. Description: Intense peat smoke, citrus fruits and sherry on the nose. From the basic tone a bit grassy. The undiluted bites the alcohol a bit in the nose. The cask strength is clearly visible. Beautiful malt comes through, almost a bit nutty. The longer I smell, the more sherry gets through. Recognizable Oloroso; not heavy and sweet, but rather of the sour-vinous kind. Sulfur in the sense of matches also resonates. Then as a counterpoint again the freshness of the citrus flavors. The typical Kilchoman note, which often reminds me of wet hay, is unfortunately only subtly recognizable here. 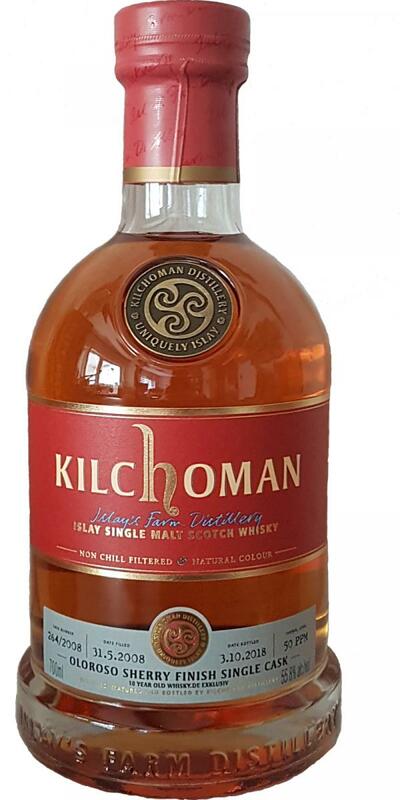 The sherry and especially the increasingly intense sulfur notes are unfortunately superimposed on the beautiful Kilchoman style. After the first sip, the nose becomes even coarser: the peat smoke and the dirty, sulphurous Oloroso sherry barely leave room for the other aromas. Description: Sweet peat smoke floods the mouth intensively. For a moment I am irritated by a strange, dull taste. Inevitably, I have to think of thick rubber mats. There is a lot of sherry and barley malt. Also tastefully earthy and dirty - accompanied by sweet barbeque sauce. Although subtle bright fruits can be guessed, I can not really name individual fruits. Everything very powerful. Some pepper bites into the tongue and in the transition to the finish, the oak comes on the plan to offer the peat smoke and the sherry Paroli. Oak, almonds and some cocoa powder are noticeable - embedded in smoky and sulphurous sherry. The Islay origin is clearly visible on the peat smoke, but Maritimes does not really exist in this bottling. Description: The finish is medium to long. With a long-lasting warming sensation in the epigastrium, the Kilchoman sounds smoky and getting drier. The whole mouth is full of peat smoke and rich malt. With its tart woody taste, the oak feels like a coating on the teeth and oral mucosa - together with almonds and a pleasant espresso aftertaste.